Members – If I have missed anyone out – please please email me! And of course… Trisha of Sugarlace and Kath of A Cupcake or Two! I am a dessert blogger from Sir Cupcakes [http://www.sircupcakes.com/], and I am started in joining the KCC. I am a filipino blogger/college student in the Philippines, and I love recreating/modernizing traditional filipino food and transforming them into cupcakes. Thank you for your consideration. *started – interested. Sorry for the typo. Come try our Pandesal, desserts and Filipino dishes at http://www.pandesalbakehouse.com.au. We are located at Beverly Hills right next to the station. I borrowed a friend’s imported DVD set of Food Safari series 3 (love that show, but so hard to find over here!) and, well, here I am! Definitely going to be working my way through the recipes you’ve featured here! I’m a Pinoy food blogger in Canada. I’m interested to join the club and share my recipe. Hi Trissa, I’d love to interview you on my radio food program on SBS. I tried to find an email address on your site, but haven’t managed to. Would you mind sending me your contact details so I can tell you more about the program? Thanks. I look forward to hearing back from you! It’s good to se a list of Filipino foodies. I think it is really in our blood us Filipino’s either we love to cook or most definitely we love to eat. It’s all about family too. I’m Filipino leaving in the US. How can I join the Kulinarya Cooking Club? Is it too late to join? Would love to submit my Pinoy recipes.Salamat! just found your site and am a filipina who is a terrible cook 😉 …but i would still love to join your club as i’m trying to improve my skills. thank you! love your blog. Hello! Just posted yesterday my first blogpost for #KCC on my site http://www.asianinamericamag.com. I baked a “VICTORIA Sandwich”, supposedly a favorite cake of Queen Victoria. I figured the white topping of confectioner’s sugar would make it appropriate for the June theme of “white”. I look forward to doing more delicious dishes with the Kulinarya Cooking Club. Hi… I found your blog when I was looking for a recipe. Your blog was actually listed under her favorites and so I clicked it.. and here I am. 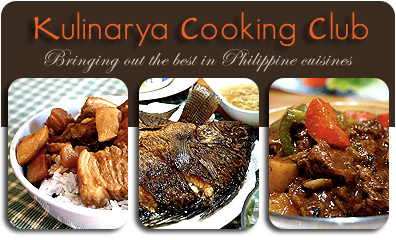 I am interested to participate in your Kulinarya Cooking Club. I am a Filipina living in Miami, USA. Pls. let me know how if it’s possible. Thank you! This is one good site. Mabuhay kayo! This is awesome! Can I please join? on March 16, 2011 at 4:21 pm | Reply Suman: rice cake in a tube. In three flavors. I’d definitely love to join this food club and get back to my Filipino culinary roots. How do I go about joining? Is the club only for GIRLS, or can I join too? @marvin – KCC is open to boys and girls… let me know if you want to join. Can I join your Kulinarya Club? Wow, so awesome to have stumbled upon this – this is brilliant! I definately fit the criteria of fitting the food addicted filipino blogger myself and i would love to join! but meanwhile, i shall be visiting all the blogs listed above! I’d like to know more about Kulinarya, how to join and what I would need to do. Hope to hear from you. I am interested to join the kulinarya group..Would love to hear from you! I’m interested to join the club, however I don’t have a blog. How can I join?